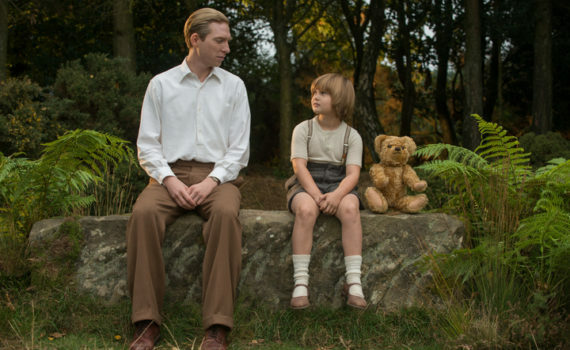 An imperfect but heart-melting melodrama, Goodbye Christopher Robin is a new Finding Neverland and another peak into the private world of an author’s inspiration. Like its predecessor, this film follows a recipe guaranteed to play with our emotions. A playwright, his personal struggles, the magic that both allows his artistic juices to flow and also heals the wounds of a life that didn’t turn out quite the way he would have written it up; we’ve seen but enjoyed it before. And don’t forget the little boy who serves as inspiration but who has a life of his own, a child who is both a character to love and an individual who longs for it. I don’t blame this movie for sticking to the script and betting on its ability to make us well up; it’s a smart idea, it was developed as well as the parameters would allow, and it succeeded, at least as much as can be expected. This is the true story of A.A. Milne’s classic books surrounding the misadventures of one very special bear, Winnie the Pooh. Milne was a veteran of WWI, an upper-crust author who couldn’t quite slide smoothly back into a life of parties and speeches after witnessing the horrors of the trenches of the Front. So he moved his family to the countryside to seek fresh ideas, but he never imagined that they would come from within his own home and from the woods surrounding it. Milne’s son, named Christopher Robin but called Billy, loved imaginary journeys through the forest, and these fictions combined with his adoration for stuffed animals led to the idea that would become one of the most successful family franchises in literary history. But fame doesn’t come without a price, and as Christopher Robin became such a public figure, Billy lost what he needed the most; a unique connection with his parents and a world that was all his own. It really was as if Domhnall Gleeson took over Johnny Depp’s role, which is fine because they both have a random ‘h’ in their first names. The characters’ situations were similar, Berry was even mentioned in the movie to be at a Milne play, the boys were equally cute, and audiences were given the opportunity to see the why behind the what. I really don’t mean that as a negative though, I’m sure there are countless books I would be fascinated to the know the meaning behind, and I’m also sure that many of those are very personal and perhaps even sad. Goodbye Christopher Robin is predictable in that way, somber and sobering, but with a magical quality that can still give you a smile. Gleeson is good not great as Milne, Robbie seems to be phoning in her performance, Macdonald and the kid basically stealing the show. The woods are beautiful, the meanings are clear, I’m glad I learned; just don’t expect Oscar-winning aspects to assail you as you watch, this is Finding Neverland content without being exactly the caliber.